The dual-beam FIB-SEM integrates a high-performance 40kV FIB column and an ultra-high-resolution Schottky field-emission SEM column. By using dedicated fabrication template patterns for automatic lift-out, fabrication processes from fiducial marking to specimen lift-out can be automated. For lamella thinning, the fabrication process from rough milling to fine-finish milling can be automatically executed. The Mill and Monitor function allows for observation and capture of sliced images for 3D image reconstruction and for internal structural analysis. 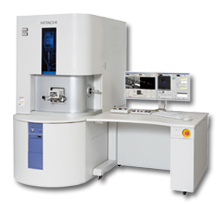 A variety of holders are available including those that are application specific, and their compatibility with Hitachi TEM/SEM products realizes high throughput and ease of use. Low CsFIB optics*2 deliver 50 nA or more of beam current (@40 kV) in an about 1 µm spot-size. The high current enables unconventional large-area milling, hard material fabrication and high throughput multiple specimen preparation. Hitachi's patented Micro-sampling technology provides smooth probe motion. Also, the probe can be used for newly developed absorbed current imaging*1 to aid fault isolation. High resolution SEM allows high precision end-point detection. Section-view function, which displays an outline of the cross-section utilizing the real-time FIB image, is ideal for preparing electron irradiation sensitive specimens like low-K material. Hitachi's unparalleled SEM column and detector design*2 enables high resolution SEM imaging during and after FIB fabrication. A side entry STEM/TEM-type staqe*1 allows the use of the same specimen holder (compatible with NB5000 and Hitachi TEM/STEM). No tweezer handling of specimen during transfer results in higher throughput TEM/STEM analysis.